Our products: Oakwood Business Systems Ltd.
At Oakwood we pride ourselves on offering our customers the best-of-breed solution that fulfils their requirements. Carefully selecting equipment from a range of Tier-1 manufacturers, or our own brand of bespoke systems we can deliver the solution to meet your needs. We can offer advice as to the most suitable servers, software and switches to meet your business needs. Servers typically host company data and applications as well as providing authentication mechanisms for your users to logon – selecting the correct server or server components can make all the difference. HP Proliant Servers offer flexible, expandable and robust performance and are available in a vast array of configurations. Please contact us to discuss your business requirements. If your needs cannot be addressed with an off-the-shelf HP server solution, Oakwood will design and build a solution that fits your requirements using the latest Intel multi-Core Processors. The Intel® NUC (Next Unit of Computing) is a highly compact computer with a huge range of processor, memory and storage options. 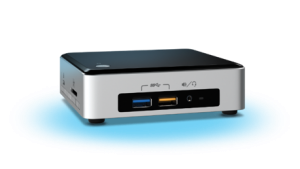 The NUC is a Mini PC with the power of a desktop, packing features for entertainment, gaming, and business productivity in a 4-inch x 4-inch form factor. Intel® bring full PC capability to small spaces, offering wireless connections, faster meeting starts, and power to drive multiple displays and digital signage. Get big results in a tiny form factor. The compact NUC format can also be mounted on to the Vesa-mount points on the rear of most displays. Modern notebooks and 2-in1 devices are thinner, lighter and faster than ever before with longer battery-life to keep you productive through the working day. Solid State Drives are available in 2.5″ and 1.8″ size or in M.2 SATA design as mainstream hard disk replacements, and in 2.5″ size as high performance Server hard disk replacement. They can be used in place of standard SATA hard disks as a direct swap without the need for additional drivers or software.